Everton moved into the Premier League's top four after Wes Brown's own goal gifted them a seventh straight win and left Sunderland bottom of the table. A spirited Black Cats display was undone with 15 minutes to go when Brown diverted Gerard Deulofeu's cross into his own net while trying to clear. Sunderland's best chance came when Fabio Borini's shot was cleared by John Stones with Tim Howard beaten. Gus Poyet's side remain seven points adrift of safety, with six games to go. Everton have broken their record for the most points in a season in the Premier League era (since 1992) after surpassing the 65 points they managed in 2007-08. Their highest tally in the old Division One was 90 points in 42 matches in 1984-85. The Toffees have also equalled their club record by winning seven league games in succession for the first time since April 1987. Just as in 1984-85, they finished that season as league champions. The Black Cats boss said this week that his side need a "miracle" to stay up and this defeat, along with wins for the two teams immediately above them - Fulham and Cardiff - will only make that harder to achieve. Brown's own goal was a cruel way for Sunderland to be denied a point but that will not matter to in-form Everton, who occupy a Champions League place for the first time since the start of January. If last week's win over their nearest rivals Arsenal was an example of Everton at their free-flowing attacking best, this was a reminder that Roberto Martinez's men can scrap for points, too. The Toffees had plenty of the ball in the first half but created just one clear chance, when Steven Naismith spun away from Brown in the box but blasted over the bar. Sunderland were not faring much better in front of goal, mustering only shots from distance by Borini in the first half-hour, and they needed Everton's assistance in finding a way through the visitors' defence. Leighton Baines inadvertently played in Borini but, after he rounded Howard, his angled shot was blocked on the line by Stones. The home side looked more dangerous at the start of the second half but they could not force the Toffees goalkeeper into a meaningful save. Everton survived a goalmouth scramble after Phil Bardsley's header was blocked, while Ki Sung-Yueng nodded wide from an Adam Johnson cross, and the game remained in the balance. Naismith went close again at the other end, firing wide after goalkeeper Vito Mannone came out of his area and failed to deal with a bouncing ball. In the final half-hour, Martinez's side finally began to show signs they could open up the Sunderland defence, but their goal still came almost out of nothing. After good work by Deulofeu down the right, Brown tried to block his pull-back at the near post but only succeeded in steering the ball past Mannone. Sunderland pushed forward in the final 15 minutes but the closest they came to an equaliser were long-range strikes by Ki and Connor Wickham, both of which were kept out by Howard. Sunderland manager Gus Poyet: "If you need to show somebody somewhere in the world where they don't watch Sunderland every week, you show him this game and tell him this is the story of the season and that's it. "You don't need to show anything else because that's it. Something always happens and that something is always, or most of the time, against us. "I don't have a word because it's not one feeling, really. It hurts, it hurts because it doesn't matter what we do, something happens. And it's not an excuse, I don't really believe in luck." Everton manager Roberto Martinez: "It was a difficult game and you could tell what was at stake for both teams. "From our point of view, to keep a clean sheet in those circumstances was very pleasing and it was also important to take one of our chances too. It makes for a very satisfying performance full of character and personality. " "We came into this game on the back of a stylish win at home to Arsenal but, in this league, you have to adapt quickly to playing different teams and doing what you have to do." For a gallery of photos from Saturday's Premier League action, head to the BBC Sport Facebook page. Match ends, Sunderland 0, Everton 1. Second Half ends, Sunderland 0, Everton 1. Offside, Sunderland. Marcos Alonso tries a through ball, but Phil Bardsley is caught offside. Attempt saved. Adam Johnson (Sunderland) left footed shot from outside the box is saved in the top centre of the goal. Sylvain Distin (Everton) is shown the yellow card for a bad foul. Foul by Sylvain Distin (Everton). Fabio Borini (Sunderland) wins a free kick in the attacking half. Attempt missed. Phil Bardsley (Sunderland) left footed shot from the centre of the box misses to the right following a set piece situation. Sebastian Larsson (Sunderland) is shown the yellow card. Foul by Gareth Barry (Everton). Connor Wickham (Sunderland) wins a free kick in the attacking half. Foul by Connor Wickham (Sunderland). Attempt blocked. Ross Barkley (Everton) left footed shot from the centre of the box is blocked. Assisted by Aiden McGeady. Attempt missed. Fabio Borini (Sunderland) right footed shot from outside the box is close, but misses to the right. Assisted by Lee Cattermole. Attempt saved. Connor Wickham (Sunderland) right footed shot from outside the box is saved in the bottom left corner. Assisted by Vito Mannone. Corner, Sunderland. Conceded by Seamus Coleman. Attempt missed. Ki Sung-Yueng (Sunderland) right footed shot from the centre of the box is too high. Assisted by Sebastian Larsson. Attempt blocked. Marcos Alonso (Sunderland) left footed shot from outside the box is blocked. Attempt saved. Ki Sung-Yueng (Sunderland) right footed shot from the centre of the box is saved in the bottom left corner. Assisted by Adam Johnson. Substitution, Everton. Aiden McGeady replaces Gerard Deulofeu. 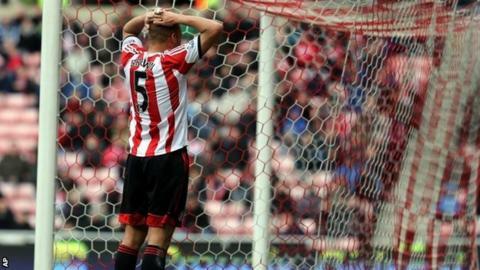 Own Goal by Wes Brown, Sunderland. Sunderland 0, Everton 1. Attempt missed. Ross Barkley (Everton) right footed shot from outside the box is close, but misses to the left. Assisted by Gareth Barry. Attempt blocked. Steven Naismith (Everton) right footed shot from the left side of the box is blocked. Assisted by Gareth Barry. Foul by James McCarthy (Everton). Fabio Borini (Sunderland) wins a free kick in the defensive half. Attempt saved. Ki Sung-Yueng (Sunderland) right footed shot from outside the box is saved in the bottom left corner. Assisted by Adam Johnson. Substitution, Sunderland. Sebastian Larsson replaces Jack Colback. Attempt missed. Adam Johnson (Sunderland) left footed shot from long range on the right misses to the right. Assisted by Fabio Borini following a set piece situation. Ki Sung-Yueng (Sunderland) wins a free kick on the right wing. Attempt missed. Romelu Lukaku (Everton) header from the centre of the box misses to the right. Assisted by Leighton Baines with a cross following a corner. Corner, Everton. Conceded by Adam Johnson. Ross Barkley (Everton) wins a free kick in the defensive half. Foul by Ki Sung-Yueng (Sunderland). Attempt saved. Marcos Alonso (Sunderland) left footed shot from outside the box is saved in the bottom right corner. Assisted by Lee Cattermole. Attempt blocked. Adam Johnson (Sunderland) left footed shot from outside the box is blocked. Assisted by Marcos Alonso. Attempt missed. Sylvain Distin (Everton) left footed shot from the right side of the box misses to the right following a corner.